I carried these thoughts in my mind for quite some time and finally, for last year’s holiday season, I decided to buy a few “Seconds” from the succesful vintages 2000 and 2005. Here now the first 2 bottles, from the 2000 vintage, which we drunk over some medium-raw steaks with sauce Béarnaise and green beans. 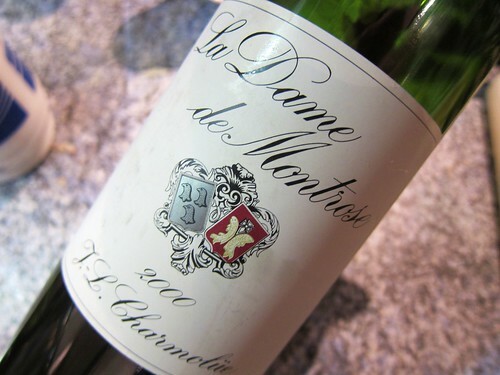 We started with a taste of 2000 Dame de Montrose from Saint-Estèphe (pictured above), which is the second wine of famous Château Montrose. With 11 years of age, yet this still shows a present tannic structure, but also a nice balance of berry fruit and a hint of spice, both in the nose and on the palate. One could give it another couple of years to become perfectly matured, but this already drinks beautifully now, in particular with food. Especially with steaks, we could add. 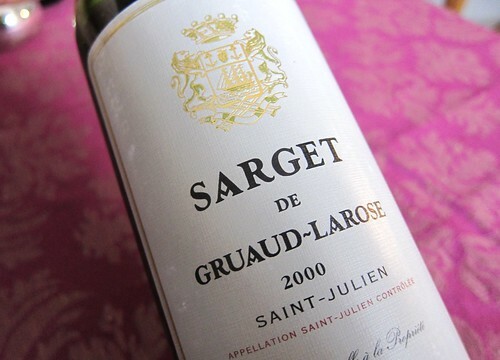 We went on with a taste of the 2000 Sarget de Gruaud-Larose, hoping for the same pleasures I once had with the 1997 vintage in London. But I should have known it: with this superb 2000 vintage, the wine still appeared too young to bring the same kind of experience. Nevertheless it drinks superbly, and I’m not the kind of wine-amateur who dislikes tannins in his wine anyway. Here, they appear fine-grained and very present, but are balanced out by juicy berry-fruit and hints of spice. Compared to the Montrose I would say that it feels even younger, needing much more time for reaching maturity. Maybe try another bottle in 2014-2015 if you’re the lucky owner of a case. Of course, this bottle also matched particulalry well with the steaks. So what’s the lesson here? Great second wines from the 2000 vintage are still a few years away from maturity, but with the right food pairing, they already bring classic Bordeaux pleasure. Next, there’ll be a posting about second wines from 2005, so maybe I didn’t learn my lesson, or I just paired it with food. PS: the 2000 Sarget sells for around 25 Eur a bottle and la Dame de Montrose at around 40 Euro.